Purpose: To develop small, lightweight, software-defined radios for use by all branches of the U.S. military. Amount: At least $295 million, a maximum of $1.4 billion, if all options are exercised. Main partners: BAE Systems North America Inc., Rockwell Collins Inc. and Thales Communications Inc.
Other teammates: Agile Communications, Altera Corp., DataSoft Corp., RedZone Robotics Inc., Sarnoff Corp., Tessera Technologies Inc., Vanu Inc., General Dynamics Robotic Systems Inc. and General Dynamics Advanced Information Systems Inc.
A soldier communicates via tactical radio in Fallujah, Iraq. General Dynamics Corp. has won a contract to develop a common radio system for all branches of the military. Now that General Dynamics Corp. has won a lucrative piece of the military's multibillion-dollar Joint Tactical Radio System program, the defense contractor is looking to garner more radio-related work for network-centric warfare from the Defense Department. Chris Brady, director of the Assured Communications Systems of General Dynamics' C4 Systems, said the Falls Church, Va., company will build on this contract to win more military business. The JTRS program is one of the cornerstones of the Defense Department's strategy to develop network-centric warfare capabilities in which all branches of the military connect via a common network and communications system. 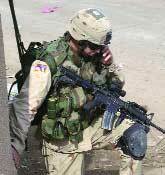 At present, the military uses several different radio systems. JTRS, pronounced "Jitters," will provide a single, interoperable radio communications architecture with multichannel voice, data, imagery and video communications. Because of its great size, the project is being rolled out in phases called clusters. General Dynamics last month beat out ITT Industries Inc., an engineering and manufacturing company in White Plains, N.Y., to win cluster five. The company was selected for its technical proposals, performance risk and cost factors, said Army Lt. Col. Richard Housewright, product manager for JTRS cluster five, during a conference call with journalists. General Dynamics will design and develop small, lightweight, software-defined radios for use by all branches of the military. The contract is divided into two developmental parts called spirals. The first spiral will modify commercial, non-developmental items and develop a two-channel portable manpack radio. The second spiral will develop single- and dual-channel handheld radios and small, form-fit variants and advance the capabilities of the two-channel radio to include additional certified waveforms. "Cluster five becomes an integral part of the Defense Department," Brady said. "It allows us to participate in all parts of the variants of these radio devises," such as using the software-programmable radios in unattended sensors and small, unattended ground vehicles. The contract work is worth a minimum of $295 million and, if all options are exercised, a maximum of $1.4 billion through 2011. The company's three main team members are Rockwell Collins Government Systems of Cedar Rapids, Iowa; the Wayne, N.J., communications, navigation and identification unit of BAE Systems North America Inc. of Rockville, Md., and Thales Communications Inc. of Clarksburg, Md. General Dynamics C4 Systems of Scottsdale, Ariz., specializes in command and control, communications networking and computing and information assurance for defense, federal and commercial customers. It employs more than 7,000 of the parent company's approximately 68,400 workers. Headquartered in Falls Church, Va., General Dynamics had revenue of $16.6 billion in 2003 and derived 66 percent of its net sales from the U.S. government. The government ? the Defense Department in particular ? is the company's primary customer. The win is "an affirmation of the work" that General Dynamics has done in software-defined radios, Brady said. The company has been engaged in the development and standardization of software-defined radios for more than 10 years. "It means we're on the right track in the way we develop the technology," Brady said. In June 2002, Boeing Co. of Chicago won the program's first cluster for preliminary design work on JTRS military vehicular radios. Thales Communications won the second cluster in March 2003 for military handheld radios, which include an external global positioning system module. Clusters three and four for airborne and maritime radio communications have been combined into one cluster called the Airborne and Maritime/Fixed Station (AMF) program. Lockheed Martin Corp., Boeing and Northrop Grumman Mission Systems are competing for the cluster. General Dynamics is a subcontractor on Lockheed Martin's team. The cluster likely will be awarded in August, Brady said.